John McAfee, one of the most renowned and powerful advocates for ICOs and crypto-economy has taken the opposite approach on ICOs in the wake of SEC [U.S. Securities and Exchange Commission] threats, as mentioned in his tweet posted today. In his tweet, McAfee has clearly mentioned his disassociation with ICOs to the point where he no more recommends them to his crypto-fans. McAfee has also hinted toward arrest of those involved in any ICO-related activities. However, the nature of the mentioned threats is yet unclear and demands more clarity. Earlier in June, he challenged SEC chairman, Jay Clayton, to a debate over the status of ICO tokens. The SEC previously issued warnings to celebrities who endorse cryptocurrency ICO projects. According to the regulatory agency, such endorsements might be unlawful — especially in the absence of full disclosure of direct/indirect compensation on the part of the celebrity in question. 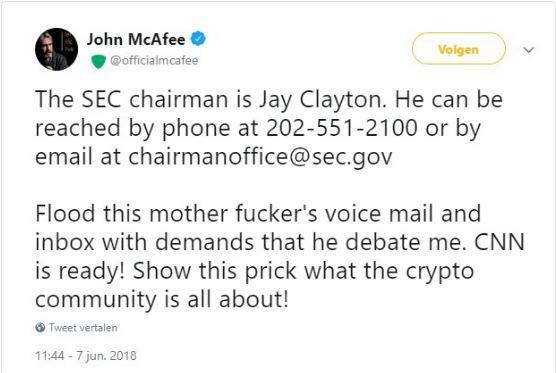 SEC, in its official statements, had triggered agitation among crypto-community; and McAfee went ballistic with his tweets on the issue.